YAY!!! Its friday ! I'm so looking forward to this weekend! Finally I cleaned up and reorganized my craft place...you all won't believe that after coming to this new house I don't have a desk yet, for the last few months I'm either making cards on the floor or on dining table....its tough as I multi task most of the time I like to leave my work spreaded out on my table ..which is not happening lately. Hope to buy a desk quickly! Okay!! Now I want to share one of my recent fave project! Last Saturday a FABULOUS box of full Stampendous arrived at my doorstep ..YAY!!! Thanks Stampendous! Love, love,love the Jumbo Cling stamps....they're just awesome!! 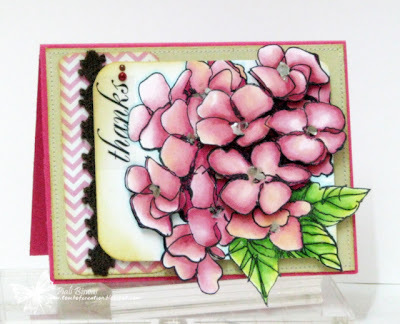 I used Jumbo Cling Hydrangea stamp for this card. I stamped the image twice and colored it with Copics...then did some fussy cutting and attached few flowers with 3D dots for extra dimension. Did you all noticed the fabulous Frantage Pearlized Mica Fragments in the center of the flowers???? Its a very new product to me...quite unique , very different from regular glitters..love it! It adds just the perfect texture and shine to these flowers!! 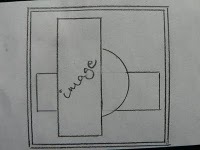 Card Positioning Systems : sketch. Moxie Fab World: Fanatical About Botanical Challenge. Thanks for stopping by... have a fabulous weekend!! 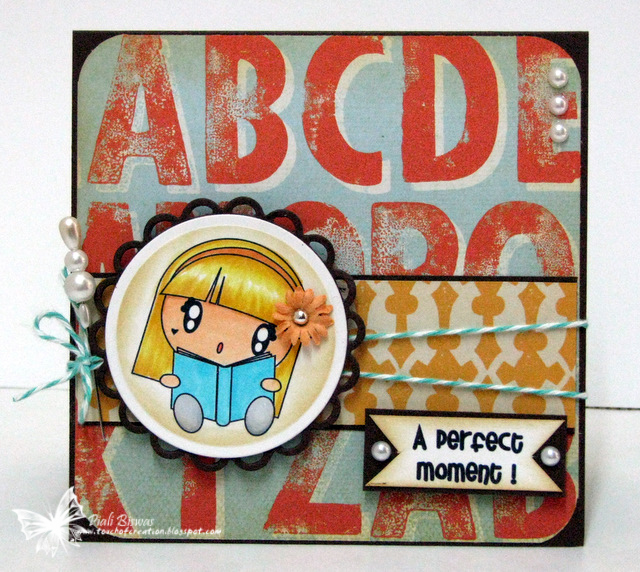 Its time for new SPARKLE CREATIONS RUBBER STAMP challenge! This week we have a lovely color challenge.. The papers are old and new Bo Bunny Mix... added Bo Bunny~ Gabrielle papers with the old stash of Green DP. 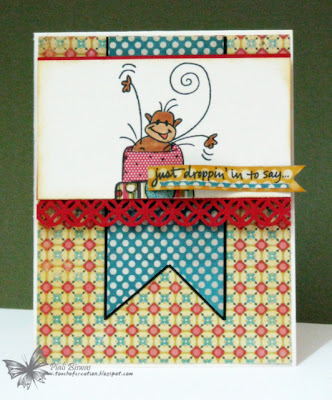 The gorgeous border stamp is from Stampendous and the sentiment is from Papertrey Ink. Make My Monday : Vintage lace and pearls. Paper Play: ribbon, lace, buttons. Make sure to check out SCRS Blog for the prize info and the challenge details. A card and some candies!!! A quick post to share a card I made last week! 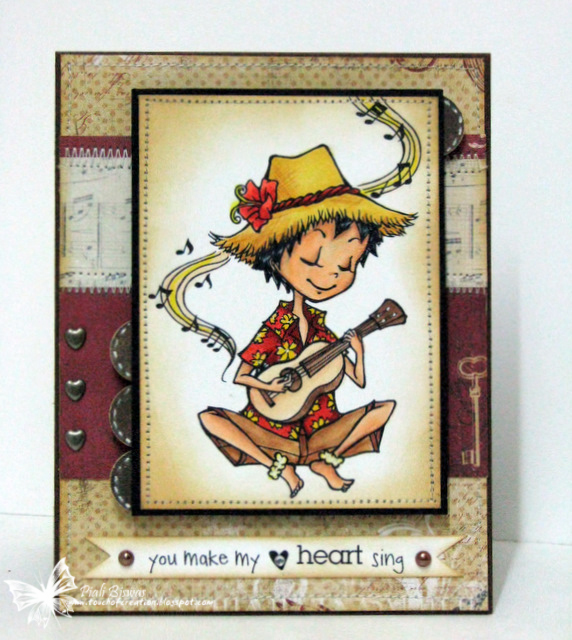 Here is a super cute Birthday card using the cute Changito from Stampendous!!! 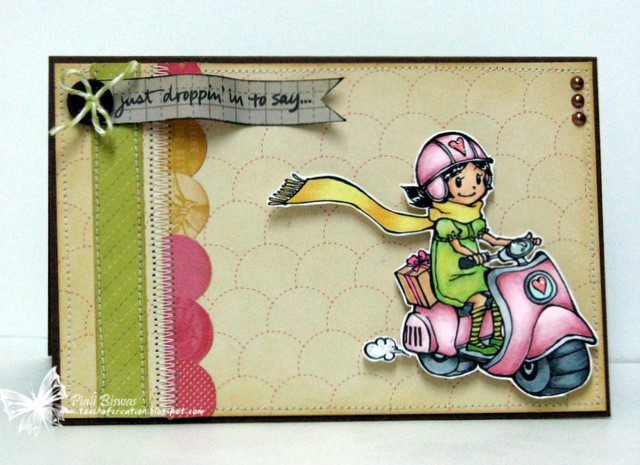 I used FTL#149 and lovely My Mind's Eye~ Stella and Rose paper collection for this card. 2 Sisters : anything Goes! 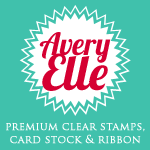 Wanna win some Fantastic Stampendous stamps & goodies???? These 4 Fabulous Ladies are giving away AWESOME Sampendous goodies!! Make sure to checkout the new Video.....HERE!!! Hope you all are enjoying CHA sneak peeks and all pictures around the blogland!! Today I'm back with another fabulous AUD SENTIMENTS CHALLENGE!!! USE the sentiment "Enjoy Your Day" or any other sentiment to make someone smile. Today our challenge is sponsored by Just Some Lines digis.. I picked this super coooooooool image for my card! I need this kind of the day for relaxing...lol!! The sun and the sentiment is from Verve Stamps. The beautiful paper is from The Girl's Paperie~ Jubilee collection! Bearly Mine : Use a Tag On Project. 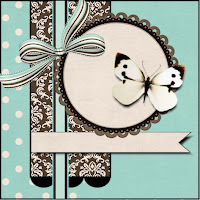 Ooh La La Creations : tag it! 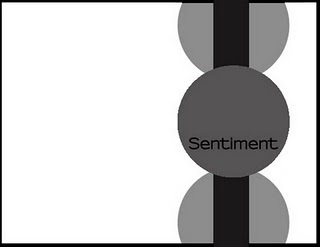 Make sure to check out Aud Sentiments Challenge blog for all the deets!!!! Hope you all had a lovely weekend!!! 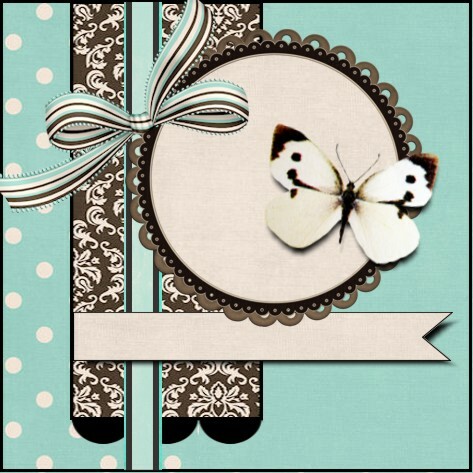 Did you all make our CHA new release shopping list...so many wonderful products...love all the fab paper lines!!!! I wish the money tree grew little faster...its still just tree...no money..LOL!!! Now I've a new SPARKLE CREATIONS RUBBER STAMP challenge for you all .. Okay! 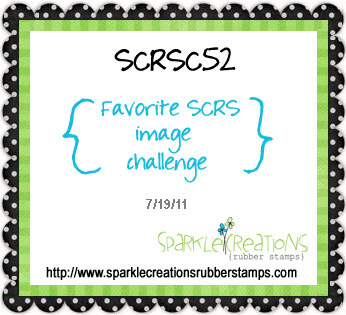 for me the challenge was to pick one favorite imagefrom all the lovely SCRS stamps...its tough when you love each & everyone one of them! As I mentioned earlier Chloe is my favorite amongst the female characters.....today I went with my most favorite male character..JOSH!!! I love this ..Street Corner Josh stamp!!! I don't know about you but I always feel like he is checking out some cool chicks...lol!!! So I went it URGR8 sentiment from Woodware USA stamps. As its a street corner so there will be a neighborhood..... the fabulous house background paper from My Mind's Eye~Good Day Sunshine Papers! Moving Along With The Times : favourtie things...favorite stamp! 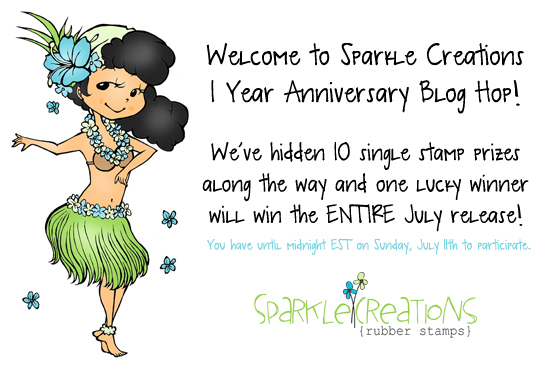 Make sure to check out the SCRS Blog for gorgeous DT creations and prize details! Also check back later for Sparkle's CHA picks...I love all the pictures everyone post on their blog..makes feel like as if I'm there in person...someday I'll be there too..a girl can dream , isn't it??? Labels: claudia and Co, My mind's eye, SCRSDT, woodwareUSA stamps. DEBBIE S.-Claudia and Co. Prize. 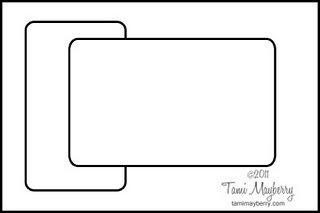 THERESA- Two Sparkle Creations Rubber stamps. CONGRATS Ladies!!! Please email me at piali[dot] biswas[at] yahoo[dot] com with "Blog candy winner" in the subject line. to all my lovely followers and all the lovely sponsors!!! WOW!! Fabulous paper lines...absolutely drooling on few...My Mind's Eye alone is HUGE..rest are yummy too!! Need to win a Jackpot or a magical Gennie or a superfast growing money tree!! If have any info about above three please let me know.. ....I forgot to share this card with you all!! I made this cute B'day card last week!! 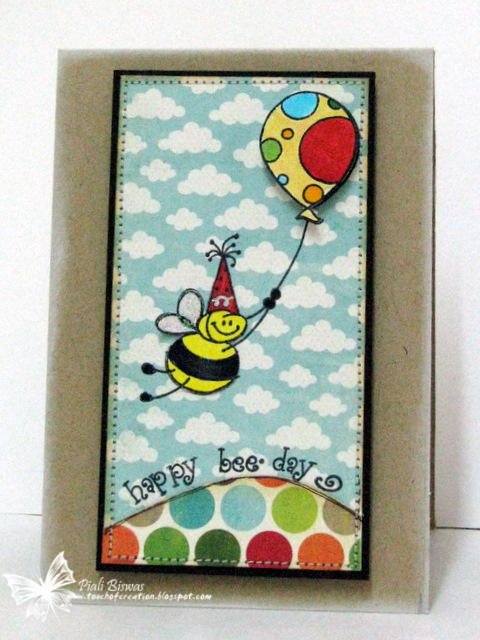 Love this Bee Happy stamp collection from Stampendous!!! The lovely DPs are from My Mind's Eye~ Lime Twist collection. This card is for the following challenge..
Paper Shelter Challenge : wings. Simon Says Stamp: Anything Goes! Crazy Amigo Challenge:Things that Fly . Clear It Out! : Wings. 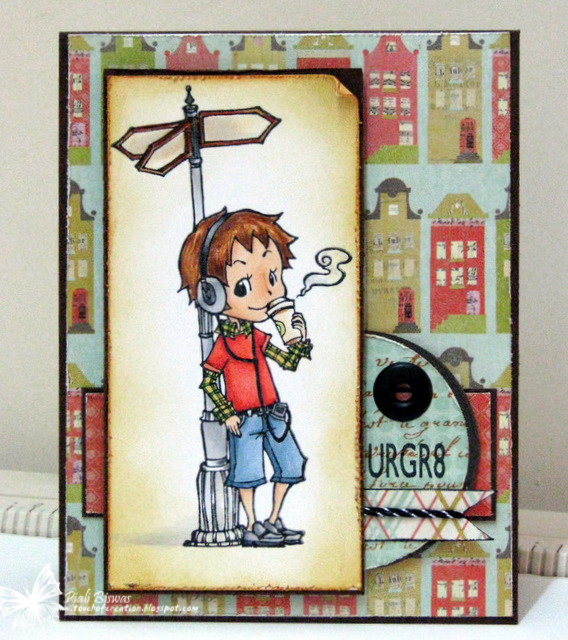 Make sure to check out STAMPENDOUS BLOG for fabulous MayArts+ Stampendous Giveaway!! 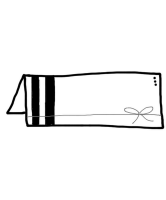 If you're not following Stampendous Blog yet...you should sign up today...Lots of interesting things are coming up soon.. lots to win HINT! HINT! Hope you're doing well...last week I was at my mom's ...her health condition was very serious again. Missed all the actions around the blogland :((. I don't know about you but Mr. Blogger is not treating me right....last week he ate up one whole pre-scheduled post . Today I'm trying to post this since morning...Mr blogger keeps on rejecting it I don't whats wrong!! Anyway I'm finally trying to do a new fresh post.. I'm so glad that I got atleast one of the many Christmas cards done.....every year I plan to work on the Christmas cards ahead of time but land up finishing them at the last moment. 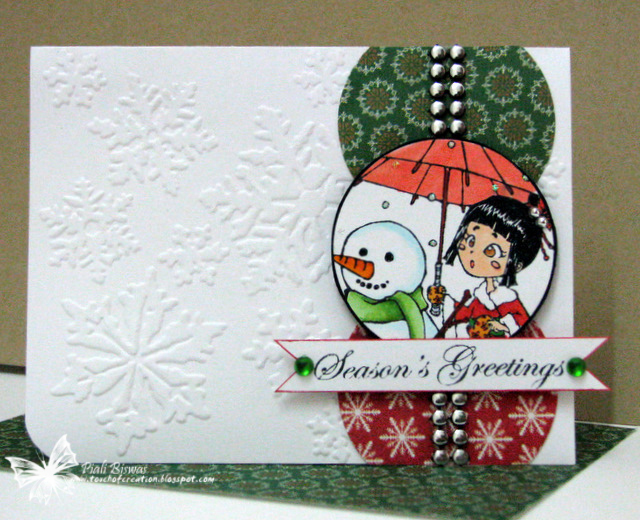 I used sweet, sweet Rin with The Snowman stamp. A clean and simple card with lovely DCWV papers and Woodware USA sentiment stamp. Just added a few bling from Pizzazz Aplenty!! This Sizzix EF is my favorite one for winter cards ...love the snowflakes!! Also added some FAB trim from Webster's Pages. Make sure to check the SCRS Blog for the prizes details !! Hope you'll join us and get ahead with for holiday cards..
Sparkle Creations Rubber Stamps 1st Anniversary Hop ! 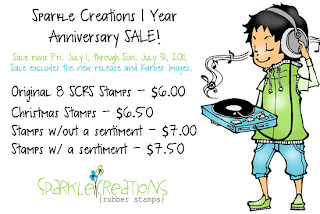 Hello and Welcome to the Sparkle Creations Rubber Stamps 1st Anniversary Hop! Not only are we here to help Sparkle celebrate a year of SCRS, but we are also officially releasing 4 new SCRS images this month -- Backpack Oliver, Bookworm Ruby, Hula Lucy and Ukulele Josh.. But wait, there's more.. we are also releasing 2 new Karber Rubber Stamps -- Rainbow Leslie and Reading Millie! They are ALL available in the store now! Love this Josh Image... I used Bo Bunny~ Timepiece DPs for this card. The sentiment is from this stamp set. 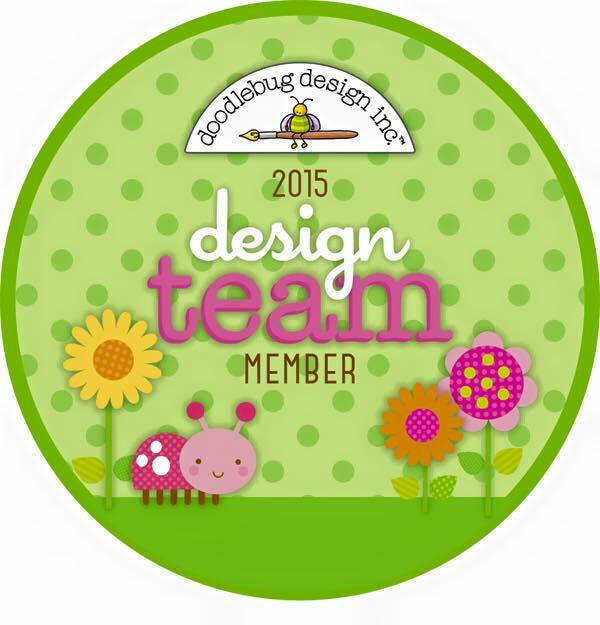 We have assembled an all-star lineup consisting of our Current Design Team, DT Alumni and past/present Guest Designers. If you happened here by chance and would like to start from the beginning, the hop begins at the SCRS blog -- please see the complete list below. What's a hop without prizes? We've hidden TEN single stamp prizes along the way and one lucky winner will win the ENTIRE July release! All you need to do is leave some love at every stop along the hop.. You have until 11:59 PM EST on Sunday to leave comments for a chance to win! 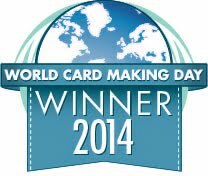 Winners will be announced on the SCRS blog on Monday. Good luck to all and Happy Hopping! 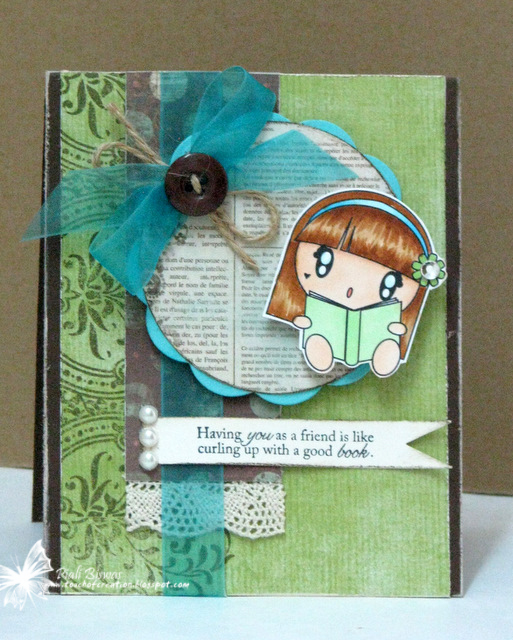 Here is another cute new release from SPARKLE CREATIONS RUBBER STAMP..... Reading Millie!!! Love this new Karber image ! The DP is from Studio Calico~ State Fair collection. Stamps R Us: there was a little girl. Be sure to visit all rest of the SCRS designers for more peeks of Reading Millie. Sparkle will be giving away a Reading Millie to one lucky person! For a chance to win, you need to comment on all of the designer's blogs (list below). Then head on over to the SCRS blog and comment on the Millie post. You have until midnight EST each day to comment. The lucky winner will be announced the following day! Are you ready for a New Karber SCRS stamp???? I used Sweet Sunday sketch by Karen for this card. 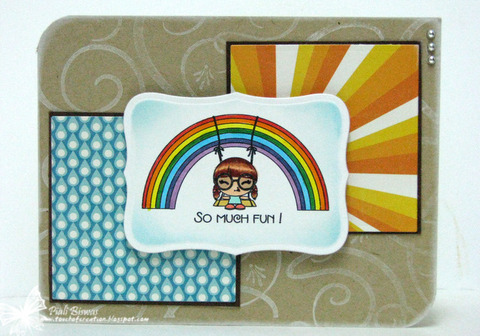 Rainbow gave me the idea of Sun and Rain....so I used the fun Echo Park~ Splash paper collection !!! Be sure to visit all rest of the SCRS designers for more peeks of Rainbow Leslie. Sparkle will be giving away a Rainbow Leslie to one lucky person! For a chance to win, you need to comment on all of the designer's blogs (list below). Then head on over to the SCRS blog and comment on the Leslie post. You have until midnight EST each day to comment. The lucky winner will be announced the following day! Hello and Happy Friday Everyone!! 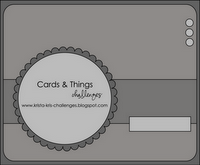 Welcome to SPARKLE CREATIONS RUBBER STAMP Throwback challenge! 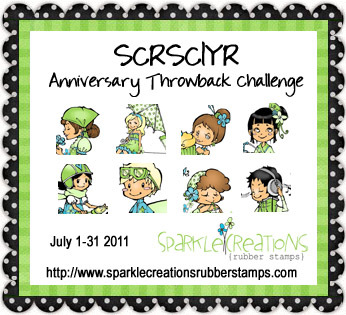 We're celebrating 1st anniversary of wonderful SCRS stamps with a lovely challenge! 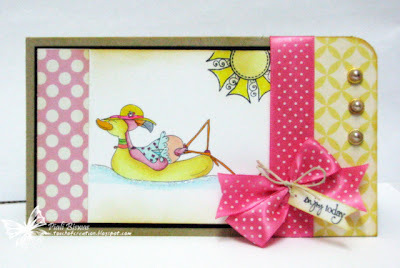 I paired Cosmo Cricket ~Upcycle papers with Skipping Stones Design Sketch. 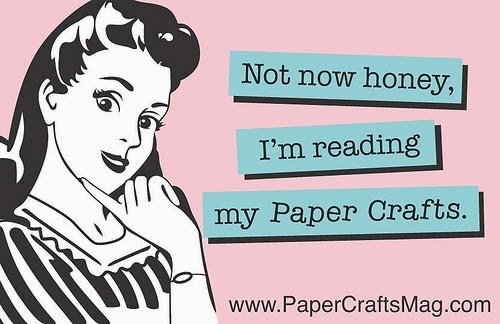 The sentiment is from Stampendous! Did you hear about the amazing prize Sparkle is offering??? The entire AUGUST SCRS Release!! !